​Lake County history is peppered with its share of crime stories. Lakeport Library’s Micro-fiche newspaper files from the nineteenth century report the stage robberies, murders, and petty crimes of the time. Thanks to the Copeland family, I can relay the story of George Coburn, which was written for the Historical Society of Southern California by a former Lake County resident, Helen Rocca Goss. In 1895 George W. Coburn was a young man, in his twenties, who lived on a farm north of Middletown with his parents. It was during this time that the hard-working folks of Middletown began experiencing numerous thefts. Items of all description were reported missing: One person’s alarm clock, another’s derby hat, and a sewing machine. Whips and robes were stolen from someone’s buggy at one residence, while a side-saddle was reported missing from another. One evening the books from the schoolhouse were stolen. “Nah,” another countered, “he only steals cattle and horses.” References to other well-known crooks and misfits were bandied about, but the outcome of the conversation always ended in a question: Who was the thief? Then, a flurry of reports revolving around the sighting of a woman, walking near Middletown after sunset, attired in all-white apparel occurred. Stories flew like Halloween ghosts with regard to the strange vision. Some folks said they heard her weeping and wailing. It was an eerie situation, to be sure. 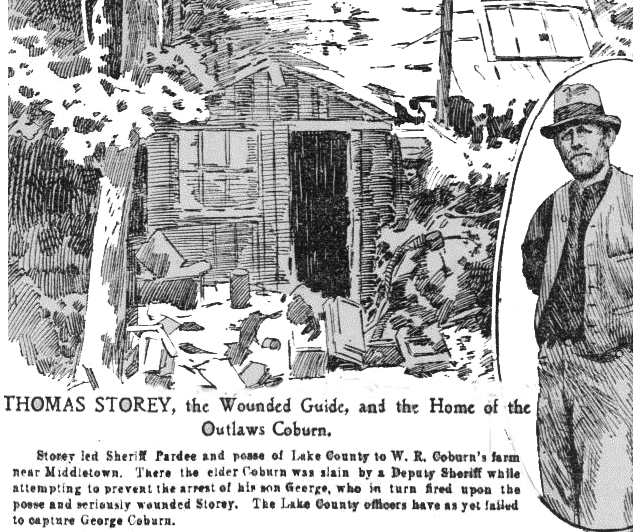 Then, in November of 1895 a local resident was out on a routine hunting expedition when he discovered a hoard of items of all description, about three miles north of Middletown near the George Coburn residence. This was getting to be a very curious situation. Sure as buckshot, Coburn was finally arrested! The June 26, 1897 issue of the San Francisco Examiner explained that it took a wagon pulled by two brawny horses to haul all of the booty to Middletown. There, it was put on public view where the locals congregated “to view this remarkable collection which surpasses the famous ‘Old Curiosity’ shop.” People found their musty, rotting buggy whips, books, and even the white outfits worn on those mysterious moonlit evenings. Throughout George Coburn’s life he was regarded as an odd individual. Now, however he was a known kleptomaniac, who could not help but to be tempted by other’s belongings. It wasn’t that he needed the items, he simply wanted to take what didn’t belong to him to build a hefty cache. It was discovered, later that he had hiding places for the stolen items all over the woods. He preferred storing stolen goods in holes he had dug into the ground, and choose hollow trees as well. He was careful to place a blanket of dirt and leaves over his hiding spots. The Middletown “Independent” newspaper dated July 3, 1897 stated, “ Stolen property will continue to be found on this ranch for the next century, for in all probability Coburn himself does not remember where he has hidden more than one-fourth of his plunder…” In one case George Coburn was charged with burglary, and bond was set at $500.00. Another case that was mentioned in the newspaper’s archives states that he was accused of “grand larceny for stealing a side saddle and a sewing machine” with bond set at $250.00. The March 7, 1896 issue of the “Independent” reported that Coburn was sentenced to three years in Folsom Prison. Before the case could be decided by the California Supreme Court, he escaped from the Lakeport jail. From that time on, Coburn’s story took on a mythical or legendary quality. The phrase, “George Coburn must be back” was uttered whenever an item, no matter how inconsequential, was missing from a residence or place of business.